This post is brought to you courtesy of Aidells® Sausage & Barilla® Pasta, but all the opinions and content are mine. Can we talk about dinners during summer? I have zero desire to cook really involved dinners right now. This is how this pretty pasta came about. Throw in some pasta, something green (because health), and lots of cheese. 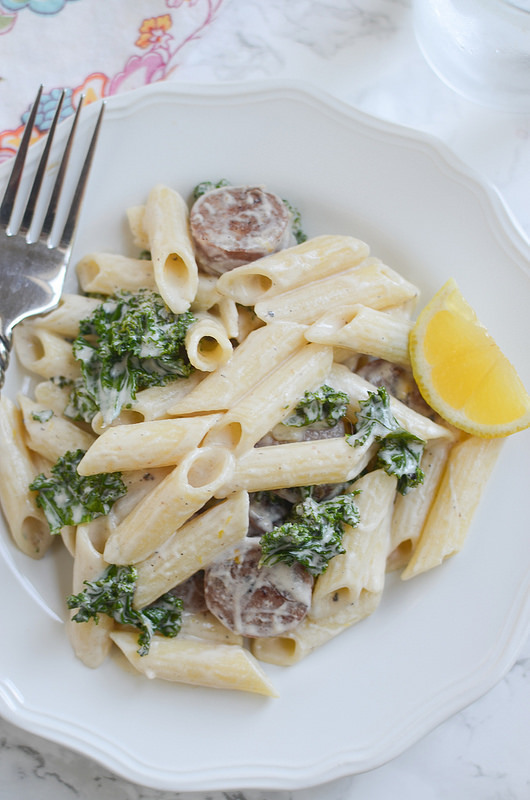 I purchased the Barilla® Gluten Free Penne and Aidells® Chicken & Apple Sausage at Target recently and used both to create this delicious recipe. I’m absolutely obsessed with Aidells® products and the Chicken & Apple Sausage is one of my favorites! I love Aidells® because they are made with no nitrates and no added hormones. All their sausages are hand-crafted in small batches with hand-picked ingredients. They’re fully cooked and ready in just 8 – 10 minutes on a stove or grill on medium heat! The Barilla® Gluten Free pasta is the number 1 gluten free pasta brand according to Nielson. They are certified gluten free and made with no GMO ingredients. They are made with a delicious blend of corn and rice and have that classic pasta taste and texture that you know and love! 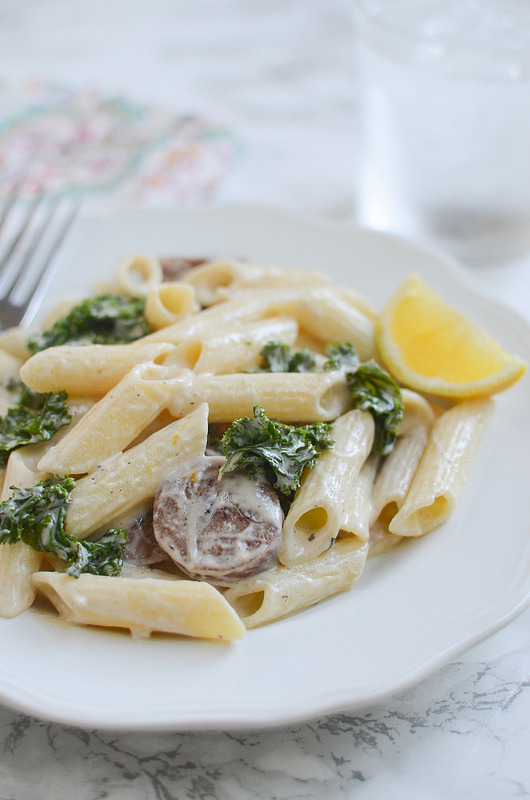 I have tried a lot, a lot, a lot of gluten free pastas in my day and I have to say, this one is by far the best. If you’ve tried any, you probably know that they don’t usually hold their shape well. This one does. 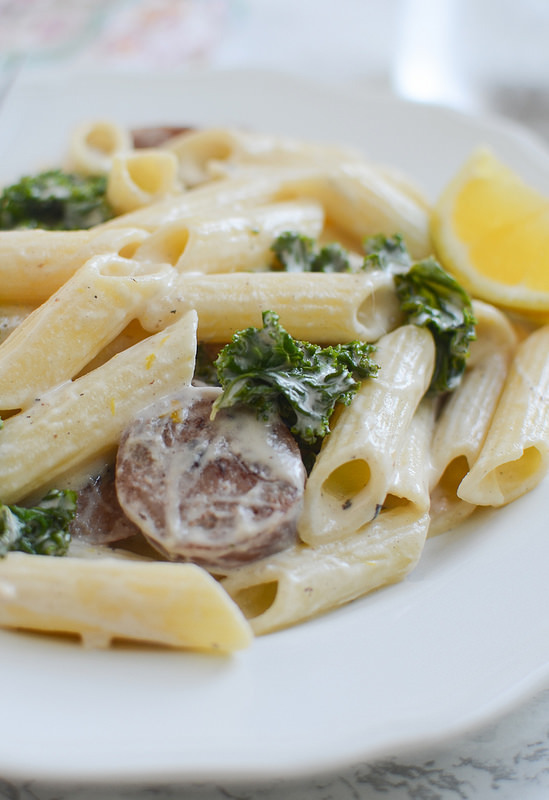 This is a quick, easy, and delicious meal. No fussy sauce here! Just reserved pasta water and goat cheese. Plus some lemon zest and juice! And if you aren’t a huge kale fan, feel free to use spinach or asparagus or whatever your green veggie of choice may be! 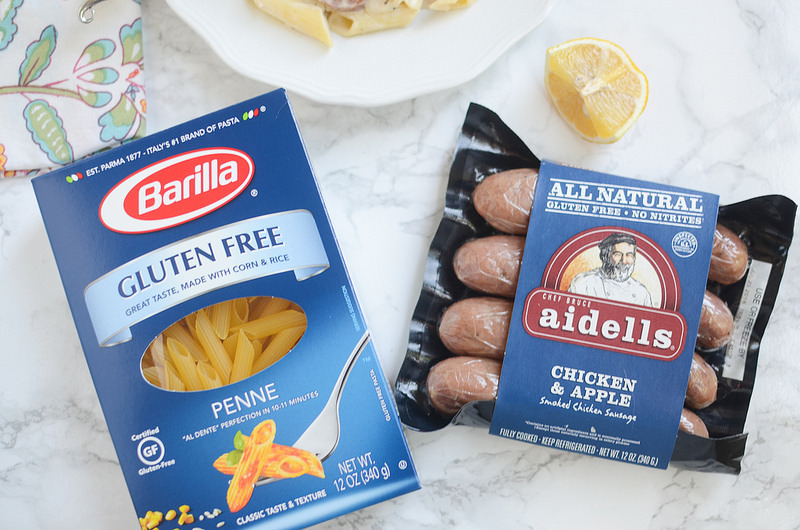 Before you head to Target to pick up your Barilla® Gluten Free pasta and Aidells® Chicken & Apple Sausage, be sure to download the Cartwheel app and add the offer to get 5% off Barilla pasta and sauces! 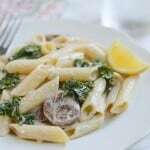 Cook Barilla® Gluten Free Penne according to package instructions. Drain. In a large skillet, heat olive oil over medium-high heat. Add sliced Aidells® Chicken & Apple Sausage and cook until browned and heated through. Add kale and cook until wilted. Remove from heat and stir in goat cheese, lemon zest, and lemon juice. Add the cooked pasta and toss until coated. One Response to "Gluten Free Lemony Goat Cheese Pasta with Sausage"